It’s hard to believe that RootsTech 2018 is already over. We spent this past weekend, from February 28 to March 3, sharing the FOREVER™ mission with passionate memory-keepers from all over North America. It was exhilarating to speak to so many people who believe in our core value of preserving family memories to be shared and passed down for generations. For those who weren’t able to attend, don’t worry: we have the inside scoop of the whole event. RootsTech is the largest gathering of genealogists and family historians in the continent. It began in 2011 and takes place every year in Salt Lake City, drawing thousands of attendees and dozens of thousands of remote participants. FOREVER had the honor this year of being a Gold Sponsor of RootsTech. With this came the privilege of showcasing our brand on the welcome bags that each attendee received. It was awesome to see so many people walking around, touting our brand! 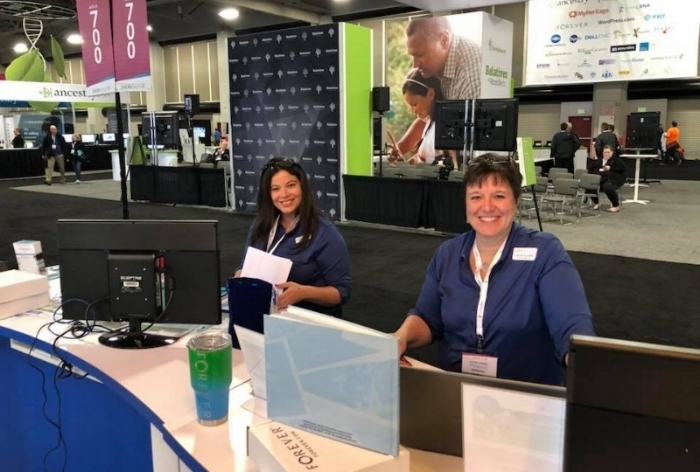 Six FOREVER corporate team members and ten Ambassadors attended RootsTech to help spread the FOREVER mission and get attendees excited about all we have to offer. Live demos took place every hour on the hour, which gave an overview of FOREVER, demonstrated a curated FOREVER account, and explained how to use core FOREVER features. FOREVER Ambassadors Adriana Mederos and Lorrie Curley sharing the FOREVER mission. Some members of our team also gave presentations to larger audiences. FOREVER President & COO, Dave Andros, led a talk on digital privacy. Read more about his fascinating presentation here! Shelley Murray also gave an incredible presentation to a packed house about our fabulous mobile applications and FOREVER Print™, our photo book creation tool. Many of the attendees were excited to learn how to celebrate their memories with archival photo books. FOREVER Team Member Shelley Murray presenting on saving memories in photo books. Throughout the weekend, the FOREVER Twitter, Instagram, and Facebook accounts shared photos of the event and encouraged users to follow our RootsTech adventures. Check out our FOREVER Team Album of the event here! We also gathered information from experienced FOREVER users and brand new users about how the FOREVER mobile application meets or exceeds expectations, as well as how it could be improved. We’re excited to take that intel back to HQ and work to continuously improve our app and uphold our reputation for excellence. Thank you Ambassadors, visitors, new and old users, and RootsTech Conference for making this weekend such an incredible event! We’re already counting down the days until next year.